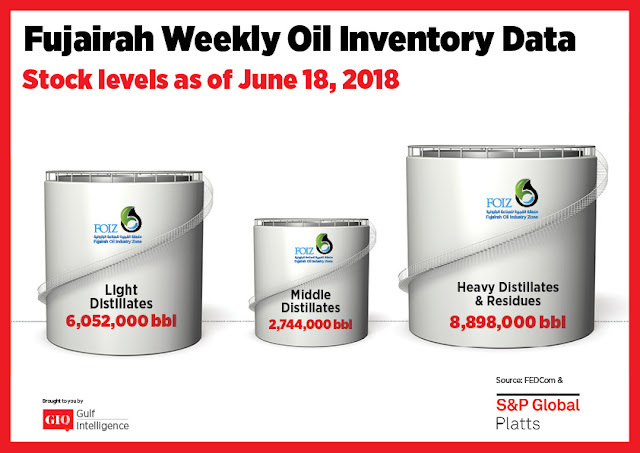 Oil product stocks at the Middle East's key oil hub of Fujairah fell 8.4% in the week to Monday, reaching a five-week low as light and heavy distillates inventories slipped. The biggest drop was in light distillates, which fell 12% to 6.052 million barrels. Gasoline demand in the Middle East and Asia remained steady, but the sentiment was showing signs of waning against rising refinery runs, S&P Global Platts Analytics said in a report Wednesday. Spot gasoline tender demand from Middle Eastern countries has been quiet in recent weeks and it remained to be seen if summer demand will be sufficient to hold up against increasing supply, the report said. Heavy distillate and residue stocks fell 8.8% to 8.898 million barrels from their highest ever level last week of 9.759 million barrels, amid healthy demand for bunker fuel in Fujairah. 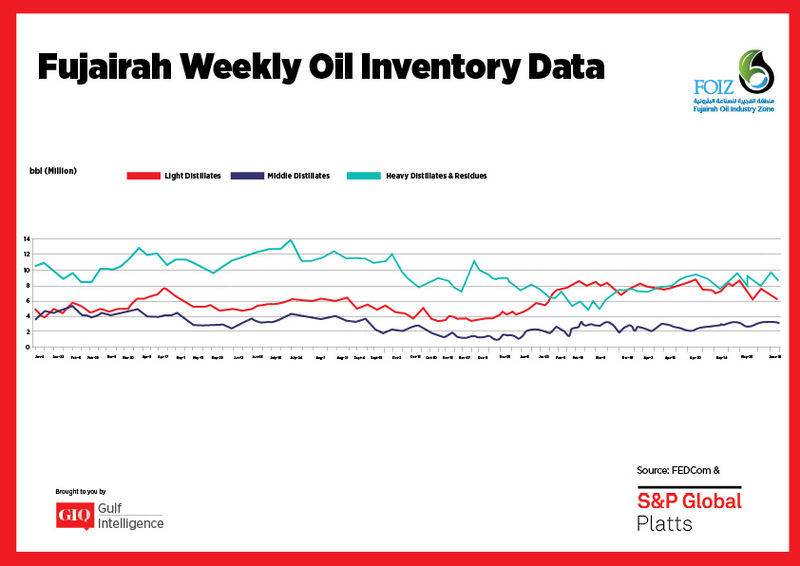 Weaker crude prices should give continued support to a fuel oil market that was already seeing high seasonal power generation demand, Platts Analytics said. Stocks of middle distillates rose 1.6% week on week to 2.744 million barrels. Kuwait's KPC and India's Naraya Energy have recently been large sellers in the tender spot tender market. Indian exports can be expected to continue to rise as domestic demand sees a seasonal downturn during the third quarter. Meanwhile, arbitrage economics for low sulfur gasoil remained unfavorable, with the front-month EFS at around minus $7-%8/mt levels and freight rates high. Gasoil stocks in the Amsterdam-Rotterdam-Antwerp region remained low, but ICE gasoil futures were in contango due to expectations of continued arrivals from the US and the Middle East, the report said.